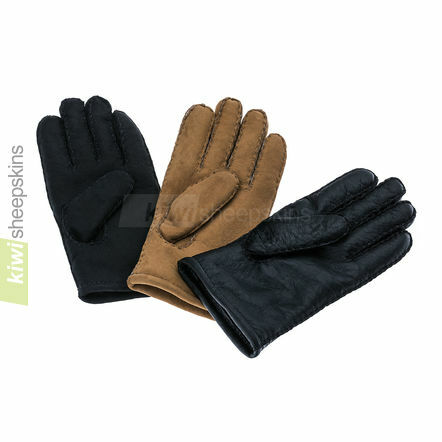 Premium hand-stitched sheepskin gloves made in New Zealand by skilled glove makers. The leather side of the slink skin lambskin is available in a suede or nappa (polished leather) finish. 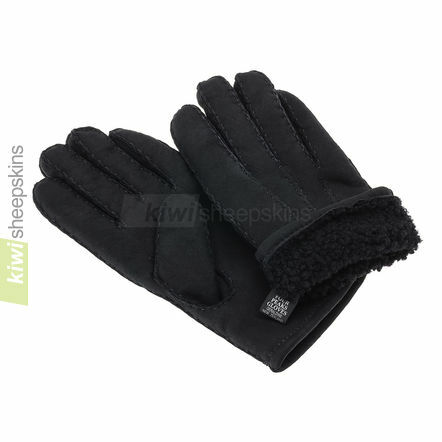 Premium quality sheepskin gloves hand-crafted by expert glove makes in New Zealand. Stylish and comfortable, with each pair unique to the master glovemaker who made them. To determine your glove size: Measure your dominant hand at the fullest part fairly loosely (excluding your thumb). The measurement (in inches) gives you the glove size. For example, if your hand measures 7 1/2 inches, your glove size will be 7.5. See the Gloves Sizing tab for details. The measurement (in inches) gives you the glove size. These gloves generally run true to size but if between sizes, go to the next size up. 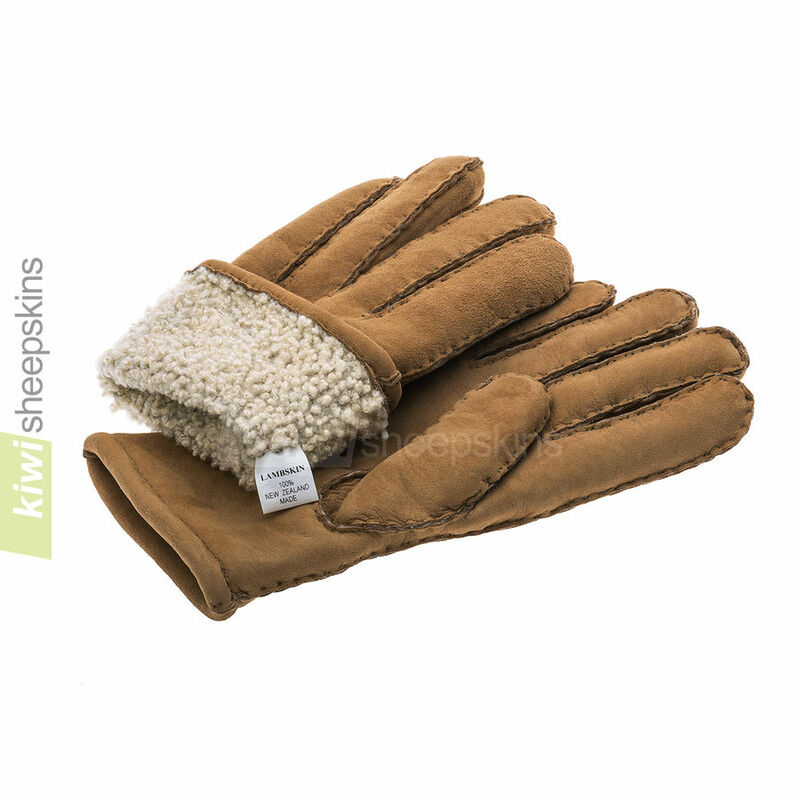 Sheepskin gloves reviews and feedback from delighted customers. Having finally used both sets of gloves with the onset of our winter I am compelled to write a complimentary note. Firstly, I was very impressed by the swift delivery (UK businesses take note!). Secondly, you certainly were not wrong about the quality .As soon as I put them on I could feel something unusual and they have proven to be extremely comfortable and indeed very fashionable. Thirdly ,and importantly, they are living up to their role- they keep my pinkies warm on the rugby touch line! I also would like to mention your sales service in the way you dealt with my many queries- fast, informative and efficient. You have restored my faith in Internet purchasing! These are exceptional value , especially given the discount. Many, many thanks. I felt should must write to thank you for the superb service I have received buying the gloves. It was so quick from start to delivery (UK), and the gloves are great. I certainly wouldn't hesitate in buying any of your products in the future. Once again thanks and Merry Christmas. I received my lambskin gloves in very good time and I am very pleased with the quality and fit, which is just right. Great price, and it's really helpful that the UK import tax is prepaid. Wonderful service! Thanks again. Thank you for the extremely quick dispatch of the gloves. They arrived the day before we left to go to Tasmania which was perfect timing. The gloves are also exactly what my husband wanted - even better than expected. Thank you for your excellent service. Just to say the gloves arrived today. I am absolutely delighted with the superb quality. They are a total credit to your firm. I was searching far and wide for the right Winter gloves and found them no closer than New Zealand. And I am glad I did: they're very well made, comfortable and most importantly, withstand our cold Canadian Winters. Thank you for the excellent service. The gloves arrived to-day, they are a perfect fit, my wife loves hers too!! Once again, that is the best service I have ever received from a business on line! Thanks very much!! I have mentioned you to my son and his wife, and they may be interested in boots later this year. I also hope to buy from you again this year. I'm giving the gloves to Mark when I see him tomorrow; I know he's going to love them! I was amazed at how soft they are on the inside. Beautiful craftsmanship!! I am fairly certain that there is nothing here in the states that even comes close to those gloves. I spent about 3 months looking for the perfect gloves for him. I looked online, & if there was a physical store near me, I went in to feel & touch. Sure, there were some really nice gloves, but none had ALL the qualities I was looking for in just one glove, except yours! Absolutely 200% worth the extra wait! Just wanted to say how happy I am with the gloves I received from you. It seems fairly difficult to find well-made sheepskin gloves for some reason. Since I have Reynaud's syndrome, the nubby interior of these gloves is really beneficial and soothing to the condition, so I am always on the lookout for a good product. Thank you for carrying these and making them available to more than the local (to you) population. Received gloves, they are wonderful, made well, classy, soft, fit perfect. Couldn't be happier, so glad I found you, so is my husband. Thank you so much. Just a few lines to say a sincere thank you for such wonderful service, order placed with you on the 8th, dispatched to me straight away and delivered to me today the 15th December. 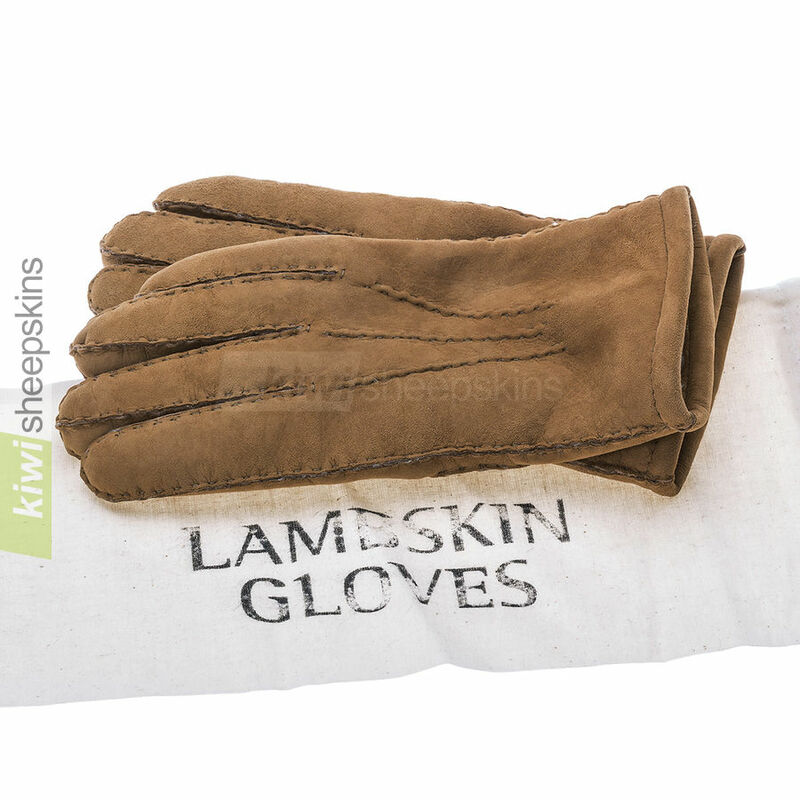 The sheepskin gloves are lovely - so soft and warm - wonderful product and first class service, long may your business prosper. I just wanted to let you know that I picked up the gloves from the post office this morning and I am thrilled with them. 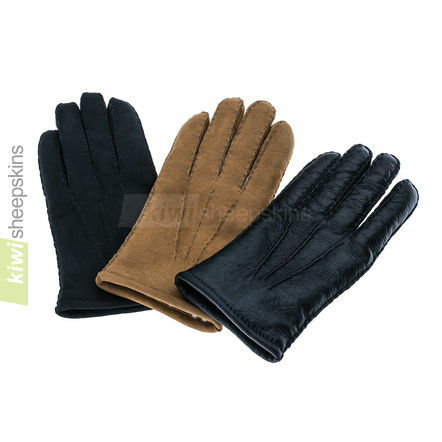 Gloves in the UK are often badly stitched and usually use coarse sheep wool. 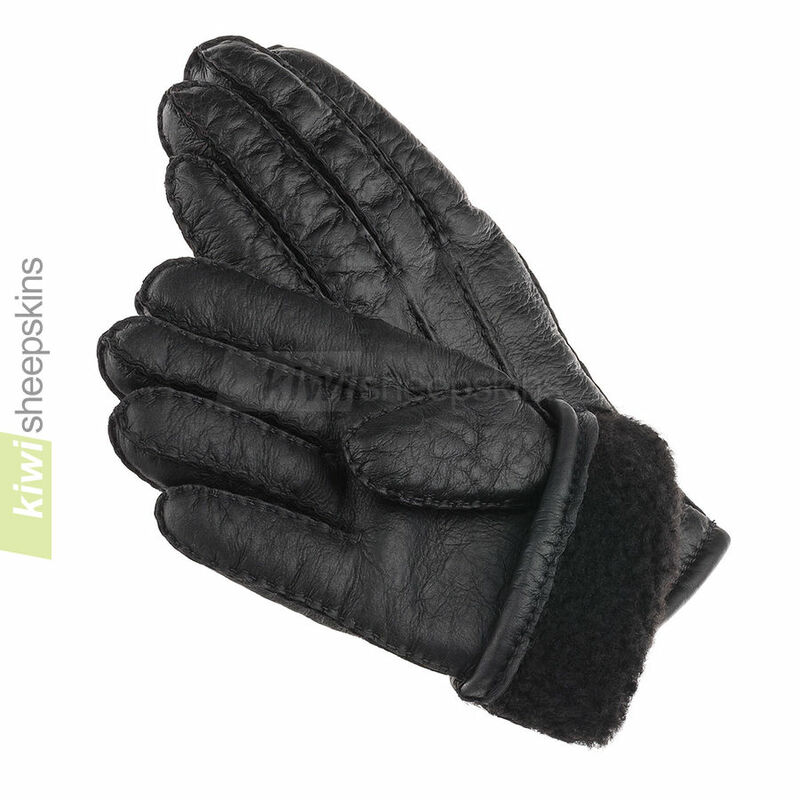 The quality of the Kiwi lambskin gloves is second to none, we cannot get anything like this in the UK of the same quality. The attention to detail with the stitching and finishes around the cuff, together with the comfort of the lambs wool against the skin and design as a whole is excellent. Many thanks to your company for putting so much effort into your products, it really is appreciated and I will definitely buy your products again! Gloves arrived today in excellent package. They're beautiful, comfy and fit like a glove! Worth every penny. Many thanks. I just had to let you know that I too am truly delighted with your boots and gloves. I have Raynaud's Syndrome and have been advised by doctors not to let my hands and feet get cold as this can cause severe complications. My hands and feet get so cold that the blood supply is reduced and they turn white and very painful. But I have discovered your gloves and boots and now do not have to worry about the cold. The service you provide is excellent and the website gives so much detailed information that I have not been disappointed with the fit, quality or speed with which they arrived and the price is amazing as the nearest thing I can buy here is double the price and you include the postage! Gloves arrived as ordered, thanks for very fast delivery. These are my second pair of these gloves and I just love them. I bought my first pair in Dunedin 7 years ago and have worn and worn them and only just this year have worn a hole through the thumb. I was in Wellington at the weekend and looked around for a new pair but the only slink gloves I could find were dearer and not as finished looking so was pleased to find yours on-line which are identical to my previous pair. Thanks again. I received my lovely gloves on Saturday 1 November what a brilliant delivery time! 8 days from New Zealand! The gloves are just perfect. A great fit and just in time for our nasty Northern winter weather. I have also had several people asking where I purchased the boa and I have passed on your details. Just to let you know my lovely gloves arrived this morning, I'm delighted, thank you very much! I have received the gloves and once more we are highly satisfied. I cannot believe how quickly they came. Just a word to let you know that today I received my lambskin gloves in perfect condition. They have travelled all the way from New Zealand to Denmark in northern Europe and I think it's a little bit fantastic. It's been only 11 days since I saw them on your website and today I'm wearing them. I'm very pleased with them. Thank you very much, it's been a pleasure doing business with you. Thank you so much for the speedy delivery of my gloves. I'm really pleased with them and they fit beautifully.